Up until recently I had never heard of a dexterity game. The concept of playing a board game that involves a bit of the ole flick of the wrist never occurred to me. Then, in one fell swoop I played a massive amount of them (well, three, but still). 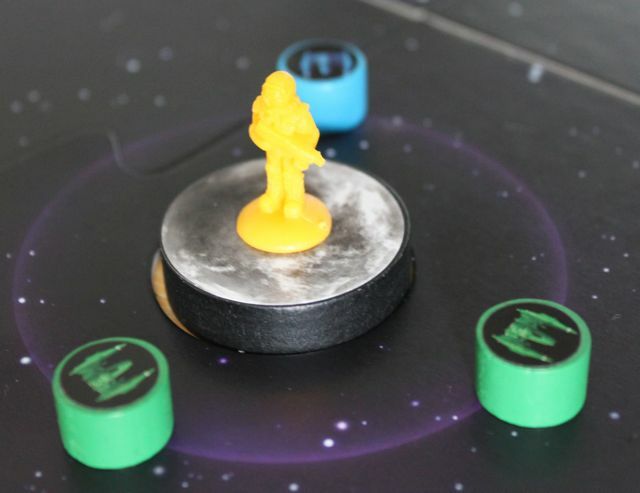 I've become a Crokinole master (though no one would agree with that statement), a racing mastermind in PitchCar, and most recently the commander of an ever expanding empire. 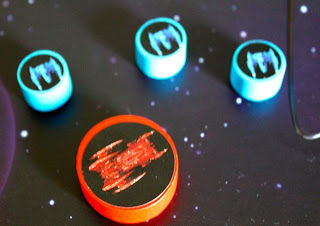 Ascending Empires from ZMan Games is part conquest, part exploration, part resource management, and is driven through flicking wooden spaceships around the board (on purpose). 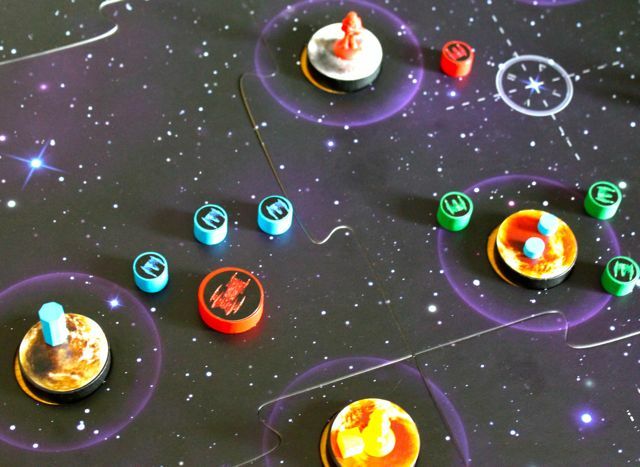 Within the game, humanity has moved on from Earth and has colonized the the galaxy with mini-empires, but now need to expand. This is where you come in. The gameboard is very large. Please excuse my cats cat food in the bacground. 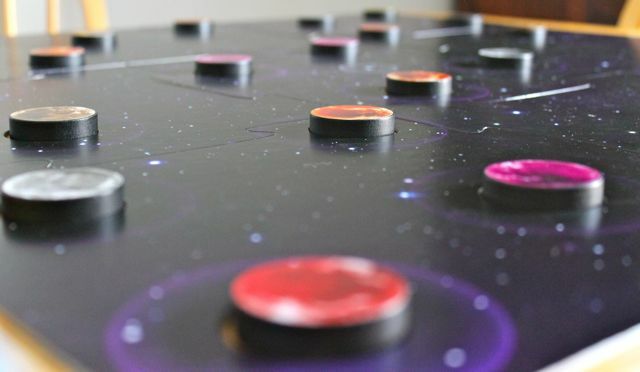 In the box, you will find 9 puzzle boards that make up a massive playing surface, a crazy amount of black wooden discs that are really four different types of planets and asteroids, and the pieces that make up four competing empires consisting of star cruisers, battleships, troops, resource stations, colonies, and cities. Also - a crazy number of victory point tokens. 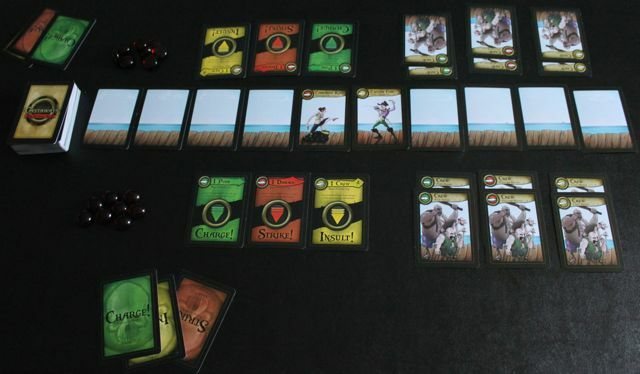 During the game, players will take turns performing one and only one action during their turn. These actions can consist of moving, building, recruiting, developing technology, and mining. Players start off with a finite number of resources (2 star cruisers and 6 troops) but can gain more throughout the game. Throughout the game you will be exploring new territory in hope of colonizing and researching in order to advance your technology which in turn will make it even easier to explore and colonize. This is driven by the flicking of your star cruisers (and your battleship later in the game if you develop your tech just right) around and across the board during the move phase to come within orbit of the planets. get close enough and you can land, which will allow you to do all sort of things. but landing on the planet is only the beginning. take 3 blue star fighters to take it out during an attack. While flicking the ships around the board is the key to success, you also must manage your troops just right in order to advance in your favor. In order to develop your technology, you need to have a research station on a planet the color that corresponds with the tech you want to advance. In order to build a research station, it has the cost of one troop that is stationed on the planet. To get to level 2 of the tech, you need to have 2 research stations, but you can only have 3 items on a planet at any time, and only one planet in your possession may have 2 research stations. As you advance your technology, you unlock benefits in the game. A level 1 purple tech, for example, will grant you an extra move action (you start off with 2), a level 2 brown will let you recruit 3 troops per turn (starting is 2), and a level 3 orange will give you the massive battleship to sling head on into your opponents without worry. Star fighters must be in range in order to attack. War is a very real (and likely) option that will happen throughout the game, especially when players are looking to advance tech or earn added victory points for destruction of others property. 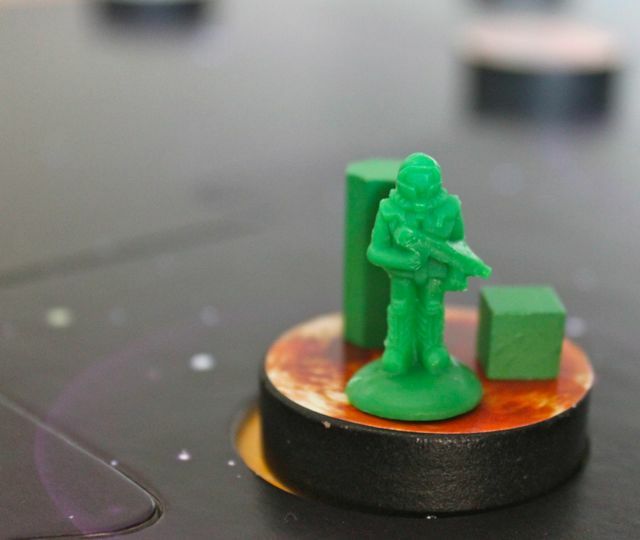 War is resolved during the end of the move phase by a very simple "I have more than you, I win" mechanic, meaning if the attacking players star cruisers/battleships have a higher attack value than the defenders defense value, and are within range of their guns, then they win. 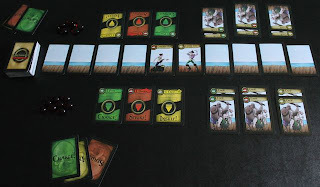 The opposing players pieces are removed from the board and the attacker earns a victory point for each piece destroyed. 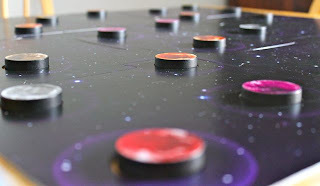 When a predetermined number of victory points are earned by players, everyone will get one last turn, and then final points are awarded for development and exploration. Player with the highest number of victory points wins. The game plays very fast, due in part to the players only being able to do one of five actions per turn, and this is a good thing. While there are only five possible actions to choose from, each of these actions have sub-actions to choose from. Being able to take more than one action per turn would bog down the game tremendously. But because of all these choices within the actions, it provides for a lot of variety and a wealth of options for strategy. The game rewards players with victory points for tech advancement by being the first to achieve a level in each tech, as well as being well rounded in your advancement (get all four level 1 techs, you get a bonus star cruiser and troop. same goes for level 2). Do you shoot up one or two tech trees to get the killer bonuses while sacrificing others, or do you get a bit of everything but have a much more commanding fleet at your bidding? blue is also in orbit, they have to go after him first. My first two times playing were very different from each other. The first time was just against my wife, and I opted for the more well rounded approach, which scored me some points, but she opted to go all out and upgrade her orange tech to level 4 almost immediately (orange tech is weapons based, great for war, not good for me in this case). Needless to say, she came after me and destroyed my forces constantly, scoring victory points for each time she took out a star cruiser or decimated my colonies and cities. The second time was a four player game, and while I was expecting it to come to blows early and often across the board, it very rarely did. everyone played balanced (for the most part) but were a bit exceptional in one tech or another. It wasn't until the end that we started going after each other, but the game was one by the player who silently expanded and mined his way to victory. The only real negative to the game is the game board itself. Due to the type of board that was used, as well as the number of segments and how tight the interlocking bits of each board are, the board doesn't always sit flat. 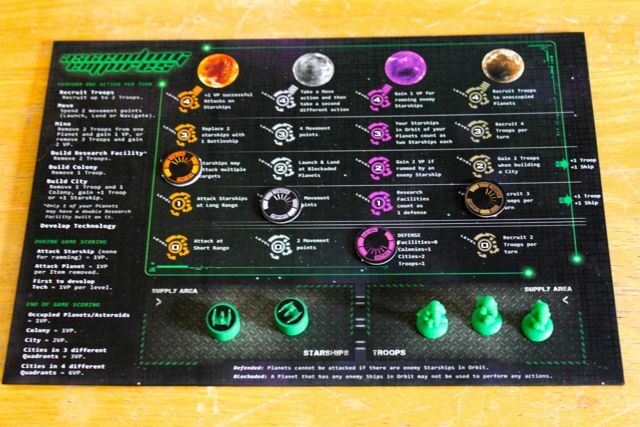 This is a problem because when you're driving your star cruiser through the void of space to annihilate that jerk of a green player, your plans are suddenly thwarted by the board itself. And trust me, green deserves it. Another issue the board has that has been reported is that the individual sections may warp over time. again, being a dexterity game, that can be a pretty big thing. Zev however has personally (I'm sure) packed a note in each box stating that if you experience warpage, let ZMan know and they'll replace it for you. 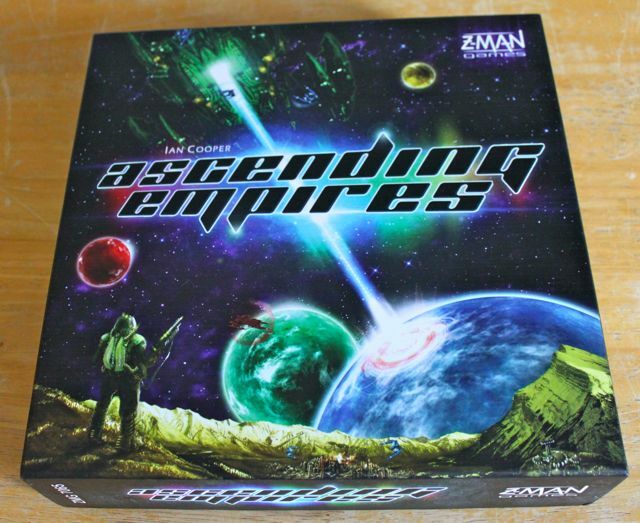 Ascending Empires is fast paced, fun, works well with 2-4 players, and is a space conquest game that you can play in a little over an hour. Definitely worth the time if you have the opportunity to play it. You know how when you were a kid you wanted to be a pirate and you'd have a coat hanger for a hook hand, and you'd find an eye patch and wear it while chasing after your younger sister with a cardboard tube from the wrapping paper that you'd use as a sword shouting "ARRR" the entire time while she ran crying? 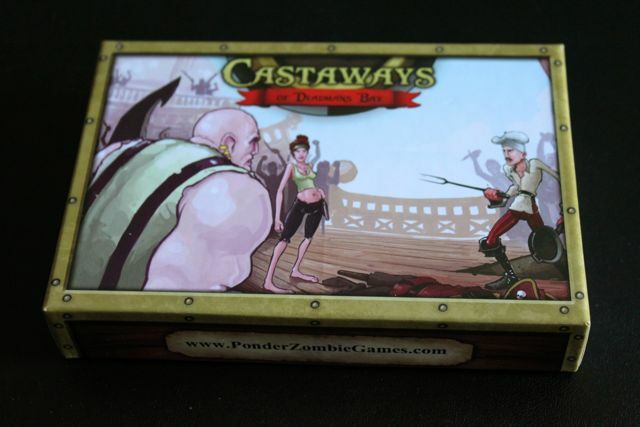 Castaways of Deadmans Bay is a new two player dueling card game from indie publisher Ponder Zombie Games. In it, the captains dead, and you're one of the pirate crew fighting to become the new captain. 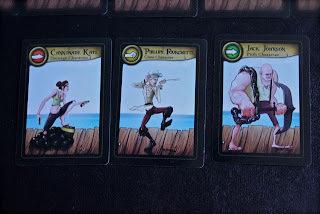 In this game, you will find 3 different pirates, 10 plank cards that make up the playing field, crew cards that you'll need to win to gain the crews support, glass beads to represent your life (try not to loose them), and a large variety of power cards that will allow you to injure, shove, and insult your way to victory and become the next captain of a pirate ship. The game play is fairly straight forward and easy to learn. Players will pick a starting pirate that specializes in one of three different types of attack, and set them to fight each other to the death (Strike), knock them back along the dock so far that they fall in the water (Charge), or insult them to the point where they loose any and all support of the crew (Insult). 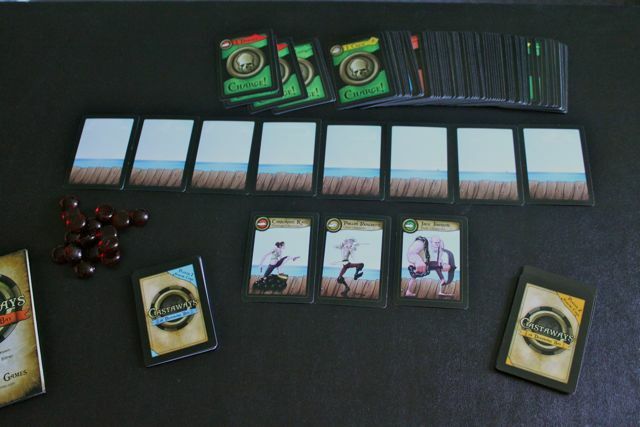 During their turn, players will draw two cards from the deck, each of these cards corresponding to one of the three attacks or a special card that will do a one time bonus. A player will only have 3 of these cards in their hand at most, and must play a card as well as discard a card before moving on. A card played will be stacked in a pile according to its attack type, and will also have an effect attached to it as well. 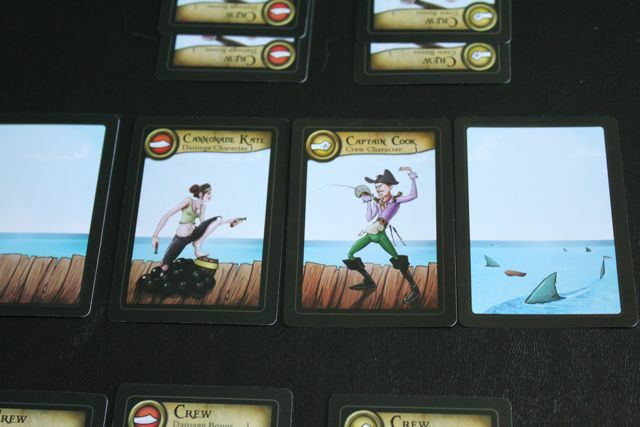 These effects will either push the pirate back a space on the deck, damage them by one point, or have them loose a crew member (causing the attacking pirate to gain a new crew member). Like the cards themselves, their effect also stack and an attack can leave quite a mark. Attacks are not always successful however. 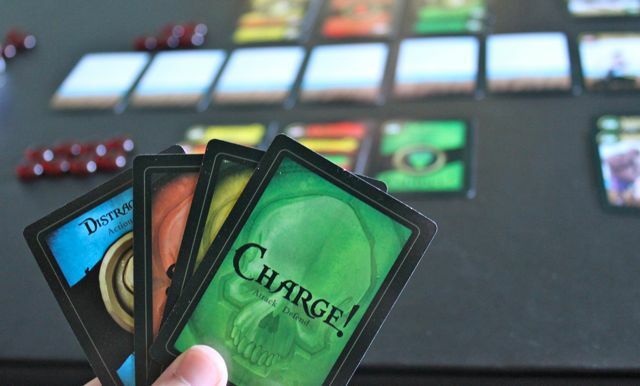 After a player plays their card, they will then secretly choose what attack they want to use by selecting one of three cards that each correspond with the three different attacks. The other player will have a chance to defend themselves by correctly guessing which attack will be played against them, and choose the same card as the attacker. If the defender is successful, nothing happens to them and they become the Attacker. If the defender is not successful, the attack lands, and ALL effects happen. Early on, this could be 1 damage here, or one push there. 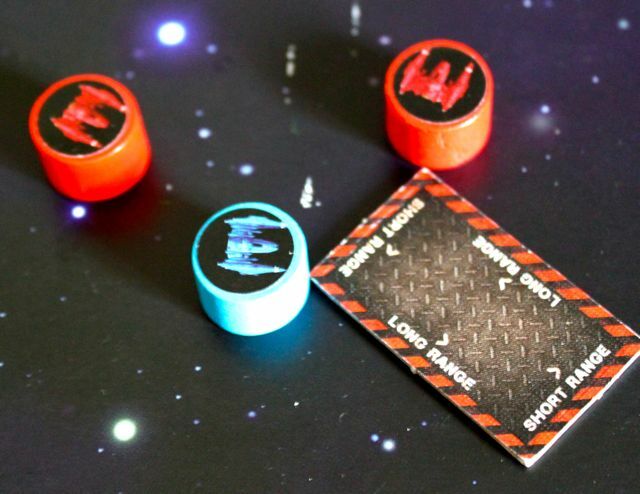 but after several rounds, they could easily be taking 4 damage, pushed 2 spaces back, and loose a crew member. Victory is achieved when a player is either pushed off the dock completely, looses all of their health, or all of their crew members switch sides. I found the instructions to be a bit awkwardly written, as they will tell you that you need to do something, but you don't know what that something is yet as it comes later on. That said all the information you need to successfully play the game is there, and due to the size of the instructions included, I am not certain if I would have been able to arrange them any better. We misread the directions and somehow managed to miss the bit about discarding cards, so after a round or two we had massive hands which really bogged down the gameplay. Playing it correctly rectified this and really sped up the game, and keeping it fast paced adds to the thrill of swashbuckling. The game is fun, light on rules, and is fairly fast paced. Having three different victory conditions available to you is nice as it allows for you and your opponent to take different approaches towards winning, and which attacks to build up with what effects in play. Building up those effects can add to the drama as all it can take is a single blow to land for you to win. Currently, I believe the only place that you can get the game is online via Amazon.com or at the Ponder Zombie Games website. Boards & Beers was sent a copy for review.